Yellow Birch was first described in 1803 by the French botanist André Michaux. It is a third of the maple-beech-birch troika – the northern extent of the mixed mesophytic Appalachian and Allegheny forests – characterizing New England and northern Great Lakes. Its northern limit is 48-49N covering 9% (≈74 M ha) of eastern US forests and 183 M ha of Canada. Great Lakes Colonization initiated during the late Holocene period (4,000 YBP) peaking 3,500-2,000 YBP. In the presence of hemlock both sugar maple and yellow birch are subordinate across their range. Yellow birch and sugar maple exert a strong influence on plant biodiversity, with equitable mixes of the two yielding the greatest diversity across a range of site conditions. The largest yellow birch communities are in southern Québec & Ontario, New Brunswick, upper Michigan, and New York. It is the official provincial tree of Québec where it is commonly referred to as merisier or wild cherry in French. Québec also contains 50% of the species total volume. Preferred climates include winter and summer temperatures of -40°C and 28°C, precipitation of 1,240-1,300 mm yr-1 with half as snowfall, and growing seasons of 60-150 days. Yellow birch occurs between 550-800 m in New England relative to sugar maple and beech with respective peaks of 600-650 and < 600 m, with optimum growth at 671, 549, and 549 m.
Yellow birch bark has few peers what with its shiny golden brown sheen and quite shaggy at maturity texture. The bark is quite resistant to decay so when you encounter what looks like a recently downed stem in the woods don’t be surprised if it is hollow or encasing well-decomposed material indiscernible from the forest floor upon which it lies. Conversely, leaf litter decay tends to be greatest for yellow birch, with sugar maple intermediate and beech the slowest of the forest type. Yellow birch seeds prolifically, maintaining a consistent albeit moderate seed and seedling bank in the forest floor preferring northeasterly, nutrient-deprived, mesic or moist, acid (pH < 6.3) soils of the Precambrian shield and the Spodosol or Alfisol order. Unlike its cohorts yellow birch thrives in swampy sites, along streams, rivers, on and around rock outcrops, and gentle to moderate upland slopes. Primary (>20 mm diameter) and secondary (10-20 mm) roots tend to aggregate along contours and the tree’s uphill side when growing on slopes with slight downhill sweeps. When exposed coarse roots resemble giant snakes and readily graft within- and between-trees. Reproduction is via wind-disseminated seed and catkin bracts with sexual maturity at 35-40 years and heights of 14 m, although old-growth exceed 300 years. In New Hampshire the following dependence on advanced regeneration was described: beech > mountain maple > sugar maple and striped maple > ash and yellow birch. Seedling success is most likely on mossy logs, advanced decay coarse woody debris (CWD) and stumps, cracks in boulders, and windthrown hummocks, because leaf litter accrual is detrimental to its survival. Specifically although anecdotally yellow birch appears to prefer red spruce logs and stumps. This pattern of stump and CWD germination along with characteristic ‘heart root’ architecture leads to unique and quite remarkable stilt roots. These are dramatic appendages resulting from the complete decomposition of organic substrates or root expansion in and around shallow parent material. When scratched the bark of yellow birch bark yields a pleasant wintergreen smell similar to its cousin to the south sweet birch. When in the same forest seedlings/saplings of these two prove difficult for even the most skilled dendrologist to discern. Yellow birch is a primary food source for yellow-bellied sapsucker, redpolls, ruffed grouse, snowshoe hare, porcupines, moose, and deer. Moose and deer prefer seedlings in the summer and green leaves and woody stems in the fall, preferring succulent materials, with persistent localized herbivory a cause of significant decline. Birds tend prefer to feed on catkins, seeds, and buds. In Vermont yellow birch readily colonizes abandoned skid trails and areas of significant canopy removal confirming yellow birch’s proclivity for soil or canopy perturbation. The bark contains betulinic acid, which hinders decay and is used to treat melanoma. Woodworkers speak of its utility for veneers, tools, snowshoe frames, and sledges and as the most valuable of the North American birches. Scattered Vermont landscapers have recently incorporated yellow birch in native plantings and last time I checked Cobble Creek Nursery in Bristol was working to propagate from seed Yellow Birch. Braun, E.L. 1950. 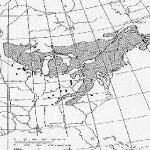 Deciduous Forests of Eastern North America. The Blakiston Co., Philadelphia. 594 pp. Dhamala, B.R., and M.J. Mitchell. 1996. Soil Disturbance and Elemental Dynamics in a Northern Hardwood Forest Soil, USA. Water Air Soil Poll. 88(3/4):343353. Erdmann, G.G. 1990. Yellow Birch (Betula alleghaniensis Britton). In Burns, R.M., and B. H. Honkala (eds.) Silvics of North America: 2. Hardwoods. Agriculture Handbook 654. U.S. Dept. Agr. For. Serv. Washington, DC. vol.2, 877 p.
Fayle, D.C.F. 1965. Rooting Habit of Sugar Maple and Yellow Birch. Can. Dept. Forest Publ. No. 1120. Gaucher, C., Gougeon, S., Mauffette, Y, and C. Messier. 2005. Seasonal variation in biomass and carbohydrate partitioning of understory sugar maple (Acer saccharum) and yellow birch (Betula alleghaniensis) seedlings. Tree Phys. 25:93-100. Habiyaremye, I., Stevanovic-Janezic, T., Riedl, B., Garneau, F-X., and F-I. Jean. 2002. Pentacyclic Triterpene Constituents of Yellow Birch Bark From Quebec. J. Wood Chem. Tech. 22(2 & 3):83-91. Hannah, P.R. 1999. Species Composition and Dynamics in Two Hardwood Stands in Vermont: A Disturbance History. For. Eco. Mgmt. 120:105-116. Hannah, P.R. 1972. Yellow Birch Root Occupancy Related to Stump and Breast Height Diameters. Vt. Agr. Exp. Sta. Bull. 669. 9 p.
Houle, G. 1992. 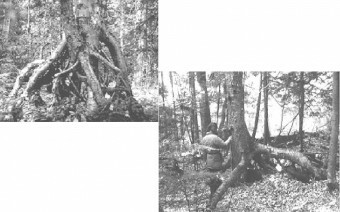 The Reproductive Ecology of Abies balsamea, Acer saccharum, and Betula alleghaniensis in the Tantaré Ecological Reserve, Québec. J. Eco. 80(4):611-623. Hoyle, M.C. 1970. 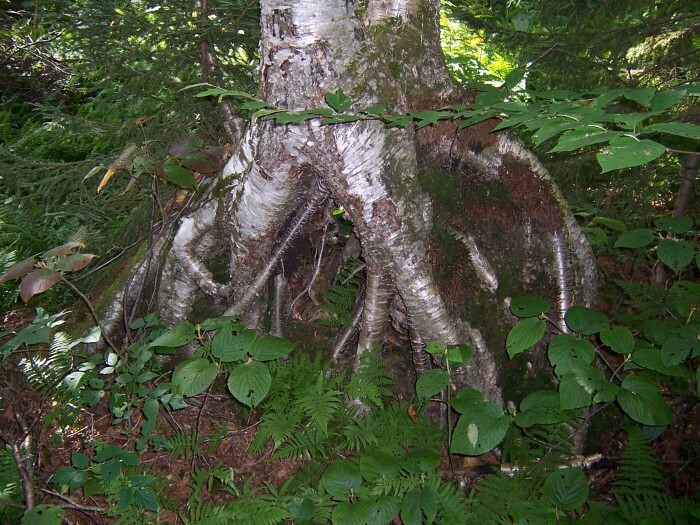 Growth and Nutrition of Yellow Birch as Affected by the Nutrient Status of a Podzol Soil. No. Am. For. Soils Conf. Forest-Soil Relat. No. Am. Pap. 1968 pp. 221-233. Hoyle, M.C. 1969. Response of Yellow Birch in Acid Subsoil to Macronutrient Additions. Soil Sci. 108(5):354-357. Hoyle, M.C. 1969. Variation in Content of Microelements in Yellow Birch Foliage Due to Season and Soil Drainage. Soil Sci. Soc. Amer. Proc. 33(3):458-459. Hoyle, M.C. 1965. Variation in Foliage Composition and Diameter Growth of Yellow Birch with Season, Soil, and Tree Size. Soil Sci. Soc. Am. Proc. 29:475-480. Jackson, S.T., and R.K. Booth. 2002. The Role of Late Holocene Climate Variability in the Expansion of Yellow Birch in the Western Great Lakes Region. Divers. Distrib. 8(5):275-284. Linteau, A. 1948. Factors Affecting Germination and Early Survival of Yellow Birch (Betula lutea Michx.) in Quebec. For. Chron. 24:27-86. Logan, K.T. 1965. Growth of Tree Seedlings as Affected by Light Density. I. White Birch, Yellow Birch, Sugar Maple and Silver Maple. Dept. For. Can. Pub. No. 1121. Oosting, H.J. 1956. The Study of Plant Communities. W.H. Freeman, San Francisco, CA. 440 pp. Oosting, H,J., and W.D. Billings. 1951. 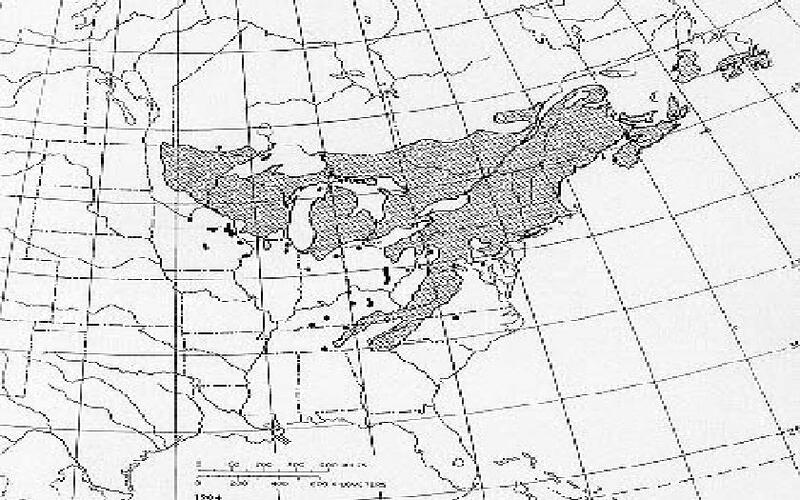 A Comparison of Virgin Spruce-Fir Forest in the Northern and Southern Appalachian System. Ecology. 32(1):84-103. Pelletier, B., Fyles, J.W., and P. Dutilleul. 1999. Tree Species Control and Spatial Structure of Forest Floor Properties in Mixed-Species Stand. Ecoscience. 6(1):79-91. Redmond, D.R. 1957. Observations on Rootlet Development in Yellow Birch. For. Chron. 33:208-212. Tyrrell, L.E., and T.R. Crow. 1994. Dynamics of Dead Wood in Old-Growth Hemlock-Hardwood Forests of Northern Wisconsin and Northern Michigan. Can. J. For. Res. 24(8):1672-1683. Zarnovican, R. 2000. Climate and Volume Growth of Young Yellow Birch (Betula alleghaniensis Britton) at Three Sites in the Sugar Maple-Yellow Birch Forest Region of Québec. Ecoscience. 7(2):222-227.